A leadership blueprint for managing cross-cultural issues in any M&A deal Management, Legal, financial, and operational issues make M&A deals highly complex endeavors. Add to the mix cultural differences between the parties involved and the complexities grow exponentially. Differences in interpersonal communication, corporate cultures, and business values can make a great deal quickly go sour. 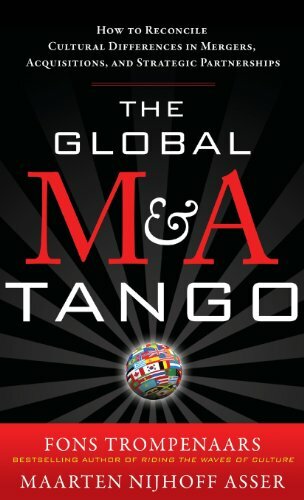 The Global M&A Tango delivers what you need. Authored by international cultural management experts Fons Trompenaars and Maarten Nijhoff Asser, this invaluable guide offers a practical framework for identifying culturally related issues and resolving them in a structured and disciplined manner that satisfies all stakeholders. Up to 50 percent of mergers and acquisitions fail to meet the objectives of any of the parties involved, and the principal source of that failure is a collective inability to merge cultures successfully. With The Global M&A Tango, you have everything you need to integrate two old entities into a powerful new organization poised for dramatic growth in the coming decades. In our rapidly expanding and increasingly volatile global economy, mergers and acquisitions are becoming the strategy of choice for businesses seeking to stimulate growth while managing risk. As more and more M&A deals are struck between global organizations, difficult new issues involving cultural differences have arisen. In The Global M&A Tango, international management experts Fons Trompenaars and Maarten Nijhoff Asser explain how to detect and manage these issues before they become major problems. Drawing on the world-renowned Trompenaars Hampden-Turner Cross-Cultural Database and Culture Compass, the authors illustrate how widely cultures can differ and, by reconciling the dilemmas created by that difference, how they can be integrated quickly, efficiently, and effectively. Change-management programs all too often ignore the culture perspectives of the individuals and groups involved--and it's often why organizations fail to realize the benefits that prompted the integration in the first place.